A user-friendly, battery-powered lavalier wireless microphone system. In today’s cyber world, we use our smartphones for everything; gaming, social media, news updates, shopping, pictures, and video. Getting rich, clear, articulate audio while recording video can be especially difficult when standing away from the microphone. The Galaxy Trek wireless lavalier microphone transmits seamlessly to the Trek wireless receiver, which simply plugs into the 3.5mm headphone jack of your smartphone, delivering quality audio to your video recording. The Galaxy Trek will also plug directly into most powered speaker inputs (1/8" & 1/4"). This conveniently adds a wireless microphone to any powered speaker you may already have. Aerobics instructors, teachers, videographers, live streamers, presenters, auctioneers, among many others will find this convenience a plus. 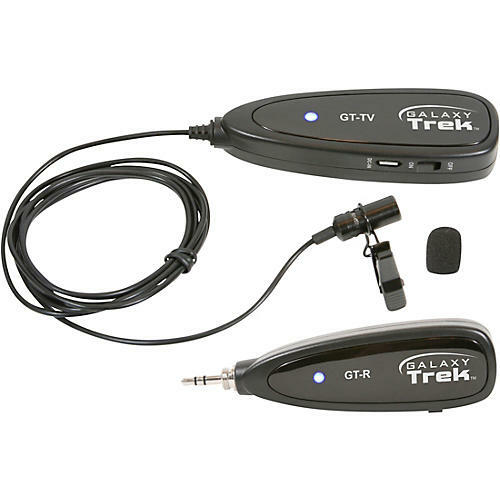 The Galaxy Trek is powered by long-lasting internal lithium batteries located in both the transmitter and receiver. Charging is quick and easy with the included micro USB cable. The system also includes two adapter cables for both Android and Apple iOS smart devices.